One thing that all North American deer seem to have in common is that they all communicate with a soft tone and they do communicate with each other. They will communicate while mating, or for company, as well as to warn each other of potential dangers. Mule deer are not as social as the whitetail deer, but also vocalize with rattling and grunts, as the whitetail deer do, although they do not appear to be as dependent upon vocalizations. The mule deer have acute hearing and are open country animals. The whitetail deer are the smallest of the North American deer family. An injured deer will let out a very loud bawl or blatt. Whitetail deer often snorts or whistles, when disturbed. When fawns or young doe are captured by predators, they make a groaning or bleating sound, which serves as a warning call of danger. This is a low grunt a whitetail doe makes to communicate with her baby and fawns often respond with a mew like sound. Fawns will also bleat to get attention from the mother. Bucks make this sound while pursuing the does. They also love to grunt, in order to show off to other rival bucks. A doe will grunt in order to locate her family or call in her young. A doe grunt is the doe’s way of saying “Come here”. Bucks make a much deeper grunt and it can mean exactly the same thing as what the doe is saying with her grunt. The tending grunt, is a reproduction call the buck makes, while chasing the doe. This is simply a bawl they make, whenever they are lonely and want company. It can also be a succession or series of bawl vocals until company is obtained. There is also, what is referred as a ‘rage grunt’ the buck makes during mating season. It makes this when the doe stops, but refuses to mate. This is a non-aggressive grunt though and shows frustration on the part of the buck. Bucks will make aggressive sniffs or wheezes, at times, to intimidate other rival bucks. The doe will often bleat as her breeding time is nigh and she may also do a breeding bellow, which states that the breeding time is now! Researchers in the wild have learned a lot about deer and the ways they communicate with each other. Many years ago, the Natives communicated with whitetail deer, mule deer, as well as all of the deer, here in North America. As the settlers came to settle, old ways of learning about animal communication died down, until the 1990’s, when hunter’s began deer calling and studying whitetail deer more in depth. Deer communication studies are now very common. 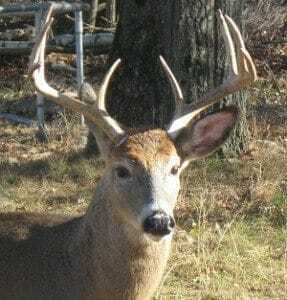 Download and learn Whitetail Deer Sounds and Mule Deer Sounds to use for your hunting or wildlife watching. Can be easily added to your sound device or electronic call or just use them as a ringtone.